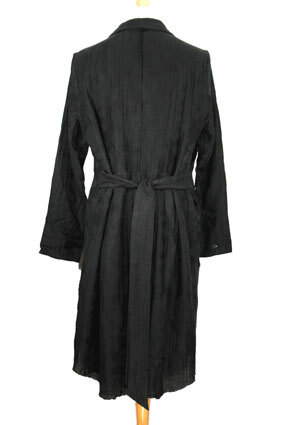 Alexsandr Manamis 4 button coat is a beautiful textured fabric. Collar and curved lapels. 2 angled pockets with flaps. Single button at cuffs. Curved hem that is longer at the rear, creating a tail. Fabric belt at rear. Fully lined. Raw edge finish on hem. Beautiful coat in a wonderful fabric.